IMAGE OF OLIVIER CRESP COURTESY OF FIRMENICH. One of the great things about Instagram is how it can sometimes put us directly in touch with people we admire. A few months ago I decided to message perfumer Olivier Cresp on Instagram about the possibility of an email interview. I was super chuffed when he replied and agreed to answer a few questions. Unfortunately, this fell by the wayside and understandably so, due to his busy schedule. 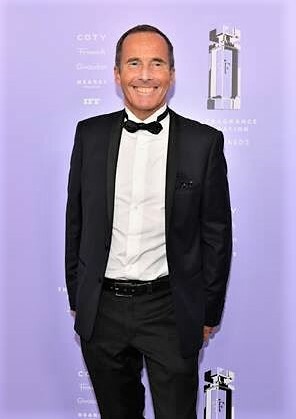 When I read that Olivier Cresp was to receive The Fragrance Foundation’s 2018 Lifetime Achievement Perfumer Award, I pushed my luck again for an email interview. Et voilà! With assistance from Firmenich’s communications department, I got my interview with the man himself. RECOGNITION: Olivier Cresp accepts his Lifetime Achievement Award at New York City’s Lincoln Centre in June 2018. This image and image below by Dia Dipasupil / Getty Images for The Fragrance Foundation. This prestigious award is a fitting tribute to the perfumer who has given us trend-setting classics such as the gourmand-on-steroids Mugler Angel EDP (1992) and the fruity-floral summer classic Dolce & Gabbana Light Blue EDT (2001). Born in Grasse, Olivier Cresp comes from a family immersed in the world of fragrances. According to an interview on the Penhaligon’s website, his great grandfather grew roses and jasmine and his grandfather and father were raw material traders. His two siblings and his son Sebastien are also perfumers. Olivier Cresp joined Firmenich in 1992 and has created (or co-created) many standout fragrances since then. These include: Christian Dior Dune Pour Homme EDT (1997). Cacharel Noa EDT (1998). Avon Today EDT (2004). Paco Rabanne Black XS EDT (2005). Givenchy Ange ou Demon EDP(2006). Nina Ricci Nina EDT (2006). Kenzo Amour EDP (2007). Carolina Herrera CH (2007). Jean Paul Gaultier Kokorico EDT (2011). Penhaligon’s Juniper Sling EDT (2011). Valentino Valentina EDP (2011). Versace Eros Pour Femme EDP (2014). More recently, he has co-created Yves Saint Laurent Black Opium and Yves Saint Laurent Mon Paris (and their various flankers). Olivier Cresp answered my questions about changes affecting perfumery, his fragrance style, fragrance favourites and collaborative projects. How has the fragrance world changed since you first became a perfumer? The world of fragrance is always evolving and will continue to evolve. We can see that consumers are more and more interested in how a fragrance is composed, the ingredients and the story behind it. There’s an increasing accent on the origin of the raw materials and the perfumers. With globalisation, fragrances need to be loved by a lot of people from different cultures at the same time. This is a great challenge for perfumers. TREND-SETTING CLASSIC: Olivier Cresp’s creation, Dolce & Gabbana Light Blue EDT, was inducted into The Fragrance Foundation’s Hall of Fame in 2016. What did you want to achieve when you first started out as a perfumer? I was literally born in to the world of perfumes. My family heritage introduced me to the “pure colours” of perfume since my childhood. I developed my olfactive memory during that time and a real passion emerged. I’m always on a quest for beauty, for a certain aesthetic. Once the aesthetic is found, I focus on its strength and unforgettable trail. MODERN: Olivier Cresp co-created Gentleman Givenchy (2017) with Nathalie Lorson. What else do you still want to achieve as a perfumer? My only objective when creating a fragrance tends to be making people feel happy and good about themselves. Above all, my work involves passion and sharing. I was named Master Perfumer in 2006 and I was also honoured with the title Chevalier des Arts et des Lettres from the French minister of culture in 2012. I treasure coaching our younger perfumers, as I have been given so much during my entire professional life and I have a lot to share today. GOURMAND ON STEROIDS: Mugler Angel was inducted into The Fragrance Foundation’s Hall of Fame in 2007. What does an award like the Fragrance Foundation Lifetime Achievement mean to you? It’s such a great honour and the ultimate recognition of my creativity and success. I’m so grateful and extremely happy to be acknowledged by my peers. I wouldn’t have dreamed of achieving such an accolade when I was a young perfumer. This wouldn’t have became a reality without the expertise and values of Firmenich. This award encourages me to continue to surprise the industry in the coming years, making my creations successes and even trying to discover again a new olfactive family. Has your fragrance style changed over the years? I had the chance to begin my career during a dynamic and creative period. I knew several cultural influences due to the opening of a global market. The search for authenticity and high quality also truly modernised the world of fragrances and influenced my creations. Even so, I consider my style a minimalist one, because I am used to expressing figurative ideas through short formulas. Every day I have the ability to create from a palette of 400 ingredients. I prefer to use only 20 to 30 of them to understand them more deeply. Do you have any favorites among all the fragrances you have created? The fragrances you create are a bit like your children: they are all different and they all hold a special place in your heart. If I would name only a few, I would highlight the two which set a new trend: Angel by Mugler and Light Blue by Dolce & Gabbana. When do you know that a fragrance you are creating is perfect and needs no more work? Creation is always a work in progress; I could put endless finishing touches on my fragrances. When creating a perfume I like, above all, the idea that people can see themselves in my creations and find happiness or what they are looking for. When I can see the smile on the face of the one who smells it, I know the fragrance needs no more work. You have collaborated on several fragrance projects (for example, YSL Mon Paris, Gentleman Givenchy, YSL Black Opium). How do collaborations like these work? Collaborative work is becoming more and more usual, as it offers a lot of benefits for the creative process. We feel enriched by such experiences. More than a simple dialogue between creators, collective creative experiences enable natural synergies with the common desire to innovate and reach the best result. It is all about inviting new visions into the dynamic adventure. We are used to working as a team and sharing a real intimacy. Sometimes we are alone. Sometimes we also look for additional expertise from different regions for a more international perspective.